We live in a society where appearances mean a lot to the beholder. We’re quick to judge based on looks, and often don’t bother indulging in conversation if the person doesn’t measure up to our standards. Everyone’s had their fair share of bad breakouts. You remember what it was like to feel so insecure about your face and how you just wanted to lie low, hoping no one would notice and start drawing attention to you. Though we believed one pimple to be the end of the world, there are other skin conditions out there that make people feel like this almost every day. Psoriasis is a skin condition that accelerates the life cycle of skin cells. Because of this, the cells begin to build up extremely fast on the surface of the skin. This extra skin formed has a scaly texture and also forms red patches that can become very painful and irritable. Psoriasis is presently known as an incurable chronic disease. It often comes and goes in cycles. 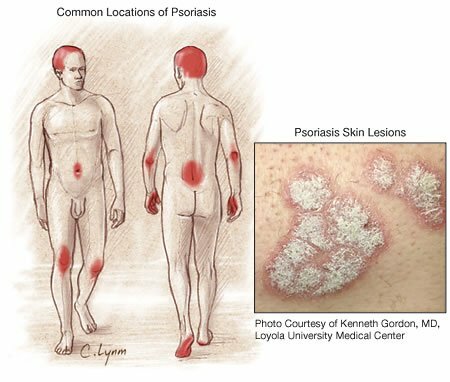 Psoriasis becomes very active for a few weeks, and then subsides for a little while before flaring back up again. The central objective is to stop the skin cells from growing. There is no medication or treatment possible for that yet, but research is being done. So far, it has been discovered that the symptoms can be managed by managing stress, quitting smoking if you do smoke, and moisturizing the skin. The cause of how psoriasis comes about isn’t entirely known. It’s believed to be associated to a problem with T cells and neutrophils, a specific type of white blood cell, in the body. T cells are in charge of defending the body from unfamiliar substances. When you have psoriasis, the T cells attack the healthy skin cells. To make up for the lost skin cells, the T cells will also begin rapidly producing more healthy ones, more T cells, and more neutrophils. Because these are being formed so fast, the body cannot keep up and symptoms will start developing. Those affected by psoriasis have varying symptoms. A few of the common ones include: dry cracked skin with bleeding, red patches covered with scales that appear silvery, itching and soreness, thickened nails, swollen joints, and small scaling spots that is more frequently seen in children. These symptoms may not appear very often but can easily be triggered. Some of the triggers of psoriasis are: infections, cuts and scrapes, vitamin D deficiency, certain medications, stress, and smoking. Imagine how aggravating and agitated you would feel if any time you got a cut, or you were feeling stressed, your skin would break out into painful red patches. It doesn’t just stop there. Once you have psoriasis, you are greater risk of potentially getting certain diseases. It’s possible to start having cardiovascular problems, become obese, have kidney problems, and arthritis as well. One of the worst complications are emotional issues. People who have psoriasis often become depressed and deal with serious low self-esteem issues. They typically withdraw socially as well and have very little contact with the outside world. Luckily, there is a very effective treatment to address all these issues. While salt therapy isn’t a cure, it’s one of the most efficient treatments for this condition. Salt therapy for psoriasis does a lot. This natural and non-invasive treatment consists of antibacterial and anti-inflammatory elements, which will help alleviate the dry and flakey skin. Salt will also help even out the pH levels of the skin, improving cell renewal. The way salt therapy works involves inhaling the salt particles. Drawing in the salt into the respiratory system will increase the oxygen levels in the circulatory system. By doing so, this will help the skins hypodermis layer. The deep cleanse under the skin will reduce the occurrence and severity of the red patches, boosting the self-esteem of the patient. The key to this treatment is frequency. Salt therapy is not like any other treatment. Too much exposure will not affect you negatively in any way. In fact, it’s encouraged that you get as much exposure as you can. Psoriasis is not an easy skin condition to deal with. There’s pain, insecurity, and many difficult days. Salt therapy can change that. While it’s not an actual cure for this condition, continuous use of it will certainly improve the skin and decrease the frequency of breakouts. It’s time to stop hiding and let yourself feel like you walk down the street without being stared at. Try salt therapy today and feel confident in who you are once more!